The MD-95 traces its history back to 1983 when McDonnell Douglas outlined a study named the DC-9-90. During the early 1980s, as production of the DC-9 family moved away from the smaller Series 30 towards the larger Super 80 (later redesignated MD-80) variants, Douglas proposed a smaller version of the DC-90 to fill the gap left by the DC-9-30. Dubbed the DC-9-90, the aircraft was revealed in February 1983 and was to be some 25 ft 4 in (7.72 m) shorter than what was then the DC-9-81 giving it an overall length of 122 ft 6 in (37.34 m) The aircraft was proposed with a 17,000 lbf (76 kN) thrust version of the JT8D-200 series engine, although the CFM56-3 was also being considered. Sized to seat up to 117 passengers, the DC-9-90 was to be equipped with the DC-9's wing with 2 ft (0.61 m) tip extensions, rather than the more heavily modified increased area of the MD-80. 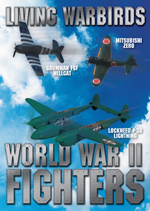 The aircraft had a design range of around 1,500 nmi (2,800 km), with an option to increase to 2,000 nmi (3,700 km), and a gross weight of 112,000 lb (51,000 kg). The DC-9-90 was designed to meet the needs of the newly deregulated air transport industry in the US, however, the development of the short fuselage MD-80 was postponed as a result of the downturn in business in the recession of the early 1980s. When McDonnell Douglas did develop a smaller version of the MD-80, it simply shrunk the aircraft to create the MD-87, rather than offer a lower thrust lighter aircraft that was more comparable to the DC-9-30. With its relatively high MTOW and powerful engines, the MD-87 essentially became a special mission aircraft and could not compete with the all new 100-seaters that were being developed. Although an excellent aircraft for specialized roles, the MD-87 has not really sold on its own, and tends to rely heavily on its commonality factor which has generally limited sales to existing MD-80 operators. During early 1991, McDonnell Douglas revealed that it was again considering the development of a specialized 100-seat version of the MD-80 family, which was initially dubbed the MD-87-105 (105 seats). The new lighter aircraft was to be some 8 ft (2.4 m) shorter than the MD-87, and would be powered by engines in the 16-17,000 lb thrust class. As first proposed, the MD-95 was to be powered by a 16,500 lbf (73,000 N) thrust derivative of the JT8D-200 series, and the Rolls-Royce Tay 670 was also considered as an alternative. This was confirmed in January 1992, when Rolls-Royce and McDonnell Douglas signed an MoU concerning the Tay-powered MD-95. McDonnell Douglas said that the MD-95 project would cost only a minimal amount to develop, as it was a direct offshoot of the IAE-powered MD-90. During 1993 McDonnell Douglas seemed to be favoring a relife program of the DC-9-30, under the program name DC-9X, to continue its presence in the 100-120 seat market, rather than concentrating on the new build MD-95. During its evaluation of the various engines available for the proposed re-engining component of DC-9X, McDonnell Douglas found the BMW Rolls-Royce BR 700 engine an ideal candidate and the BMW Rolls-Royce BR700 engine was selected to power the aircraft on February 23, 1994. McDonnell Douglas was planning for all MD-95 assembly to be undertaken in China, as an offshoot of the Trunkliner program, for which McDonnell Douglas had been negotiating to have up to 150 MD-90s built in China. The MD-90 Trunkliner deal was finalized in June 1992, but the contract was for a total of 40 aircraft, including 20 MD-80Ts and 20 -90Ts. The MD-80 has been license built in Shanghai since the 1980s. However in early 1993, MDC said that it was considering sites outside China, and was later seeking alternative locations for the assembly line. In 1994, McDonnell Douglas sought global partners to share development costs. It also began a search for a low-cost final assembly site. 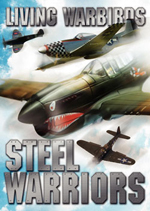 Halla Group in South Korea was selected to make the wings; Alenia of Italy the entire fuselage; Aerospace Industrial Development Corp. of Taiwan, the tail; ShinMaywa of Japan, the horizontal stabilizer; and a manufacturing division of Korea Air Lines, the nose and cockpit. 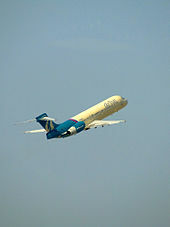 Picture - An AirTran Airways Boeing 717-200 climbing away in 2006. 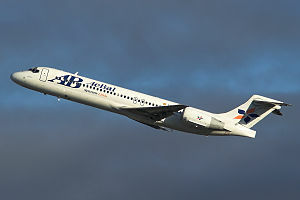 After McDonnell Douglas merged with Boeing in August 1997, most industry observers expected that Boeing would cancel development of the MD-95. However, Boeing would go forward with the design under a new name, Boeing 717. Some believed Boeing had skipped the 717 model designation when the 720, and then the 727 followed the 707. The 717 name had actually been used within the company to refer to the KC-135 Stratotanker. 717 had also been used to promote an early design of the 720 to airlines before it was modified to meet market demands. A Boeing historian notes that the air force plane had the designation "717-100" and the commercial airliner had the designation "717-200". The lack of a widespread use of the 717 name left it available to rebrand the MD-95. 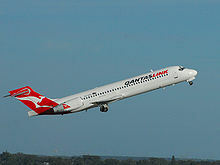 Picture - A QantasLink 717 departs Perth Airport, Australia in 2007. The 100-seat market was overcrowded until 2001, but several potential competitors disappeared. BAe canceled its Avro RJX (an updated BAe 146 with modern engines); Fairchild Dornier closed its doors, taking the 728/928 project with it; and Bombardier canceled its new BRJ in favor of a less ambitious stretched 90-seat CRJ900. The remaining players are Boeing, Airbus with the A318, and Embraer with the E-195. The worldwide fleet was then largely made up of aging twinjets with relatively high operating costs, notably the DC-9, early model 737s, and the Fokker 100, plus the newer four-engined BAe 146, which is a prime prospect for refurbishment. 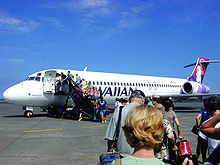 Picture - A Hawaiian Airlines 717 boarding at Kona International Airport, Hawaii for an interisland flight in 2004. Increased competition from regional jets manufactured by Bombardier and Embraer took a heavy toll on sales during the airline slump after 2001. The beginning of the end came in December 2003 when Boeing lost a US$ 2.7 billion contract from Air Canada, who chose the Embraer E-Jets and Canadair CRJ over the 717. In January 2005, citing slow sales, Boeing announced that it planned to end production of the 717 after it had met all of its outstanding orders. A major difficulty with the 717 model was its lack of commonality with other Boeing aircraft. The 717 had no commonality with other aircraft, even prior MD-80 and DC-9 aircraft upon which it was based. 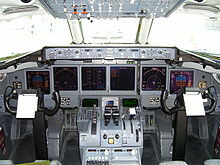 The trend with aircraft manufacturers, particularly Airbus, was to make a "family" of aircraft with similar cockpits and systems, which would require only one "type-rating" for a crew. 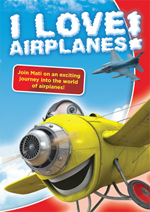 That way, whatever size of aircraft that was required on a particular route-even changing down to the day if necessary-could be used with any of the crew type-rated for the family. Although the 717 had operating costs 10% lower than the A318, airlines considering the 717 could not take advantage of the cost savings gained through commonality. Airbus used a commonality approach starting with their A320 narrow-body family (including A318, A319, and A321), and Boeing embraced this concept with their Next-Generation 737-600, -700, -800, and -900 models. Embraer, in their new E-Jet family, also took this approach, offering four regional aircraft in a common family, the largest of which had operational capabilities very close to the 717. The 156th and final 717 rolled off the assembly line in April 2006 for AirTran Airways, who were the 717's launch customer as well as its final customer. The final two Boeing 717 airplanes were delivered to customers AirTran and Midwest Airlines on May 23, 2006. The 717 was the last commercial airplane produced at Boeing's Long Beach facility in Southern California. In conjunction with Parker Hannifin, MPC Products of Skokie, Illinois designed a fly-by-wire technology mechanical control suite for the 717 flight deck. The modules replaced much cumbersome rigging that had occurred in previous DC-9/MD-80 aircraft. The Rolls-Royce BR715 engines are completely controlled by an electronic engine system (FADEC - Full Authority Digital Engine Control) developed by BAE Systems, offering improved controllability and optimization over its predecessors. Corporate version of 717-200, unveiled at EBACE Convention in Geneva, Switzerland, on 7 May 2003. Configurable for 40 to 80 passengers in first and/or business class interior (typically, 60 passengers with seat pitch of 52 in, 132 cm). Max range in HGW configuration, with auxiliary fuel and 60 passengers, 3,140 nmi (5,815 km; 3,613 miles). Complements BBJ family. Boeing 717-100 (-100X): Proposed 86-seat version, formerly MD-95-20; four frames (6 ft 3 in, 1.9 m) shorter. Renamed -100X; wind tunnel tests began in early 2000; revised mid-2000 to eight-frame (12 ft 8 in, 3.86 m) shrink. 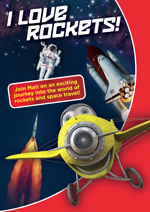 Launch decision was deferred in December 2000 and again thereafter to an undisclosed date. Shelved by mid-2003. The 25 remaining aircraft are stored with as of yet unknown fate. Impulse Airlines (7) - later acquired by Qantas. Jetstar Airways (14) - originally owned by QantasLink and were later transferred back when Jetstar Airways received A320s. Trans World Airlines - 50 ordered with 30 delivered, aircraft later acquired by American Airlines but sold to AirTran Airways (no. 773-799 AirTran ships are former TWA). As of March 2009, the Boeing 717 has been involved in 5 incidents, with no hull-loss accidents and no fatalities. The incidents included an on-ground collision, a hard landing and one attempted hijacking.